They decided to do a feasibility study, contacting local arborists to get the big picture story on what was being done with urban timber. “We got some really interesting information,” said Savics. 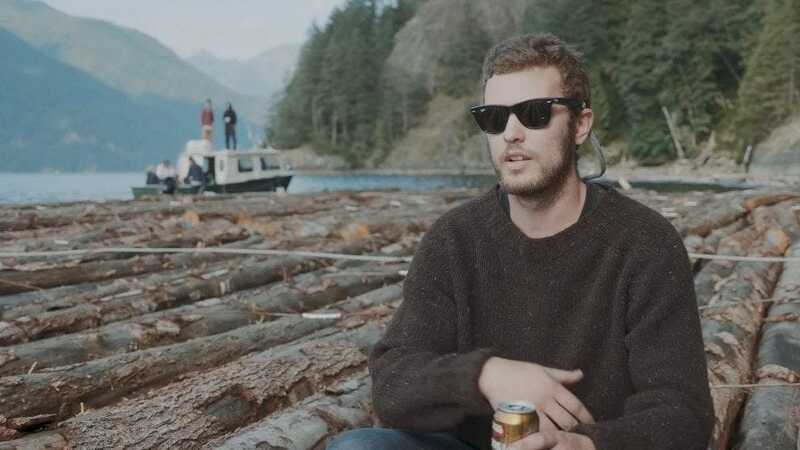 “We went to the forestry department at the University of British Columbia and got some information about what was coming down in terms of urban timber. Then we went to retailers and looked at what they were getting per board foot. At each step along the way, we were getting more excited about the potential to move forward.” And move forward they did by setting up a small shop in an industrial area of North Vancouver. 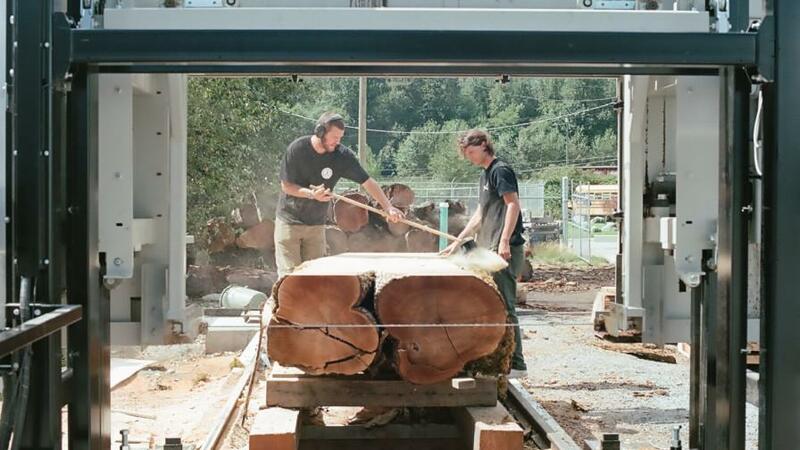 “When we were operating the mill from the house, we were getting sales from Craigslist. 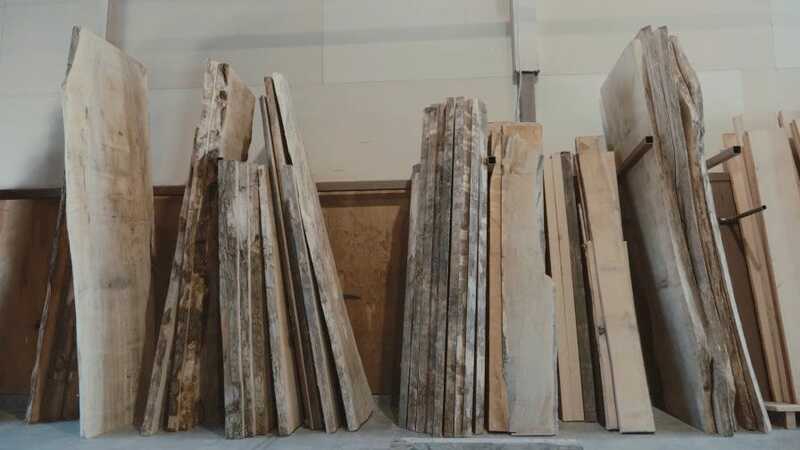 We had inquiries from furniture manufacturers that wanted high quality, large slab, large diameter soft and hardwoods. 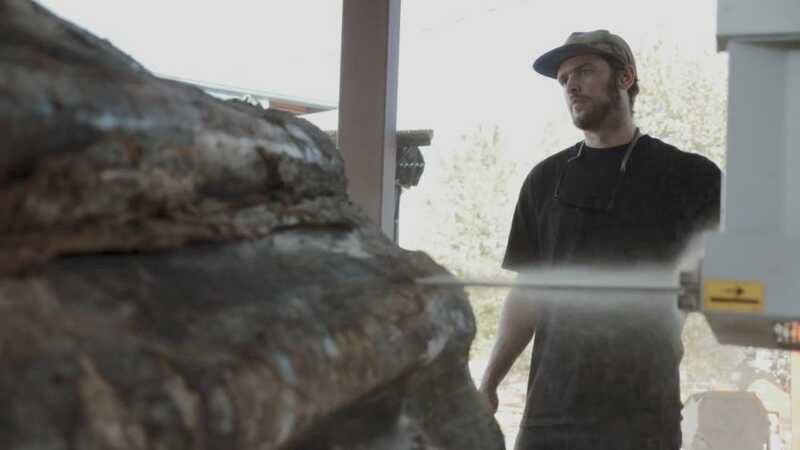 We were selling wet slabs—and that prompted the move to the shop, too, because we needed a dry place to store the wood.” They quickly had their new 2,000 square foot shop full of dry timber from their first big kiln load. “When we had a fully stocked shop of dry materials, that’s when the furniture inquiries really started coming in,” explained Savics. 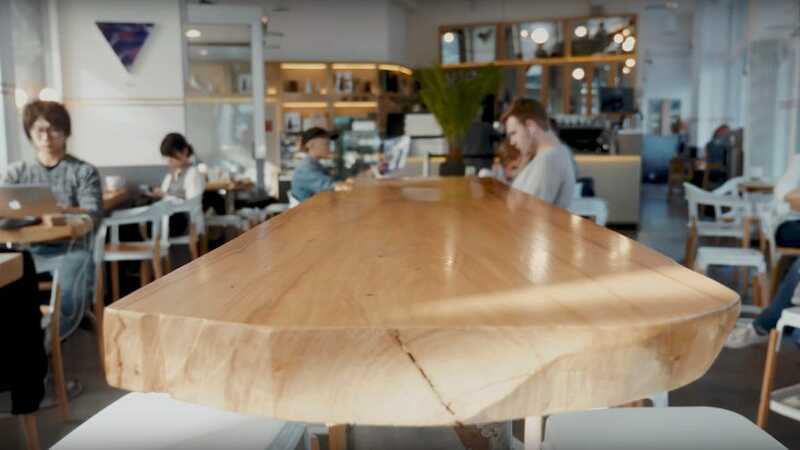 “A lot of customers were coming in and asking if we could build what they were looking for, like a big live edge board table. Danny and I looked at each other, and we said, well, let’s just do any project that comes in the door—let’s just try it. 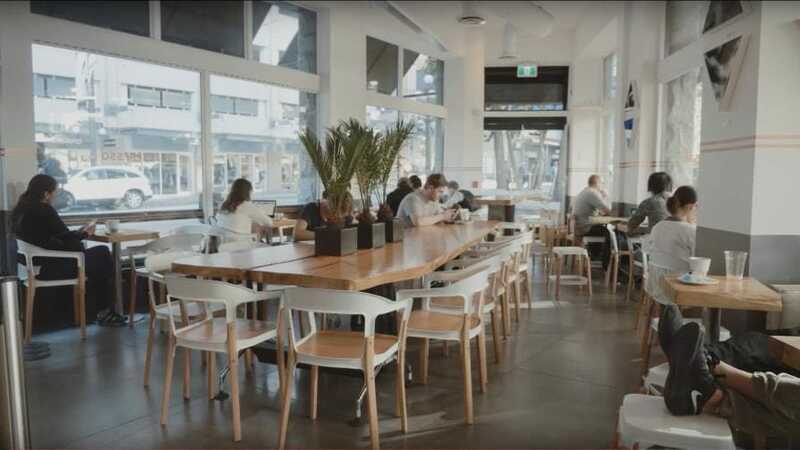 We weren’t hesitant—we jumped on it.” So in addition to offering hardwood and softwood cut from urban timber, Vancouver Urban Timberworks also offers customers help with the design and build side, and have since done a broad range of furniture designs for customers. 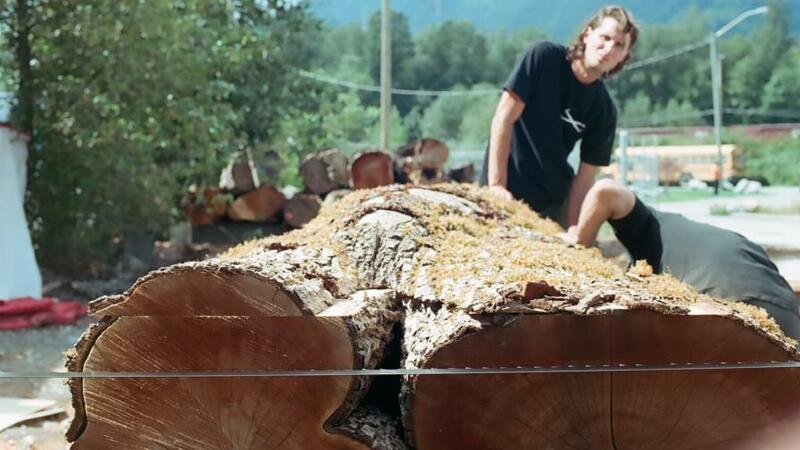 Vancouver Urban Timberworks is working on setting up its own kiln operation, but the really big news for the company is the new sawmill it has set up at its satellite facility in Squamish, 40 miles north of Vancouver. 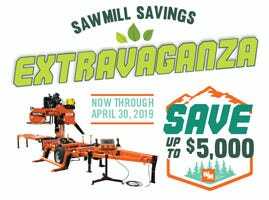 The Alaskan Chainsaw Mill had served them well, but it was clearly time to ramp things up, so they installed a Wood-Mizer WM1000 sawmill—the first to operate in Canada. 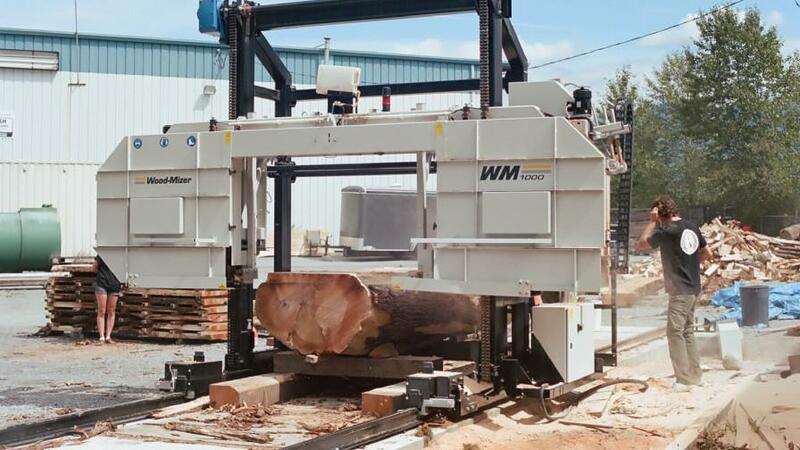 The WM1000 headrig is designed to break down large hardwood and softwood logs with a capacity center cut of up to 67” and uses 2” to 3” thin-kerf narrow bandsaw blades which provide more material recovery. 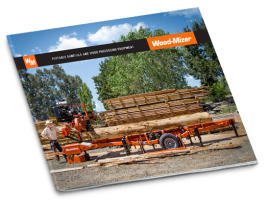 Durable and easy to use, the band sawmill features a saw head with a massive throat opening that moves along a twin-rail frame. The oversized blade wheels on the WM1000 reduce stress on the blade and the long blade length gives longer cutting time between sharpenings. The two partners report that the WM1000 has worked out very well and from the research they’ve done, they don’t expect the WM1000 to require much in the way of maintenance. 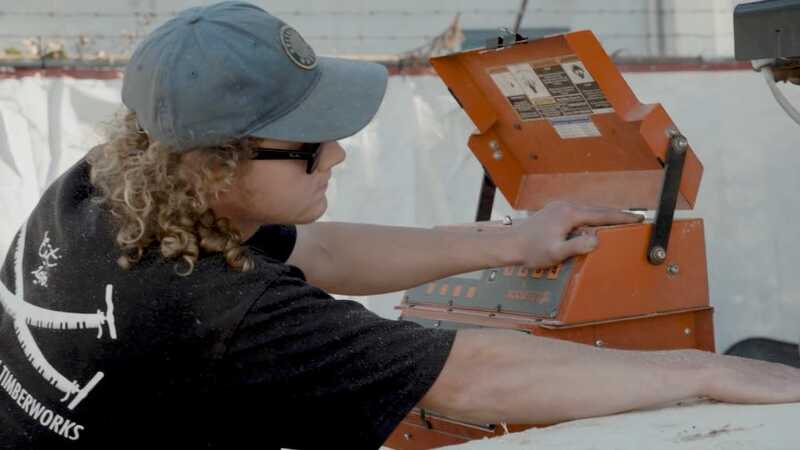 “From what we’ve heard from other people running the equipment, such as Goby Walnut in Portland, Oregon, the saw is almost maintenance-free.” Most of the time, the maintenance is focused on the bandsaw blades, which is so important, says Hagge. 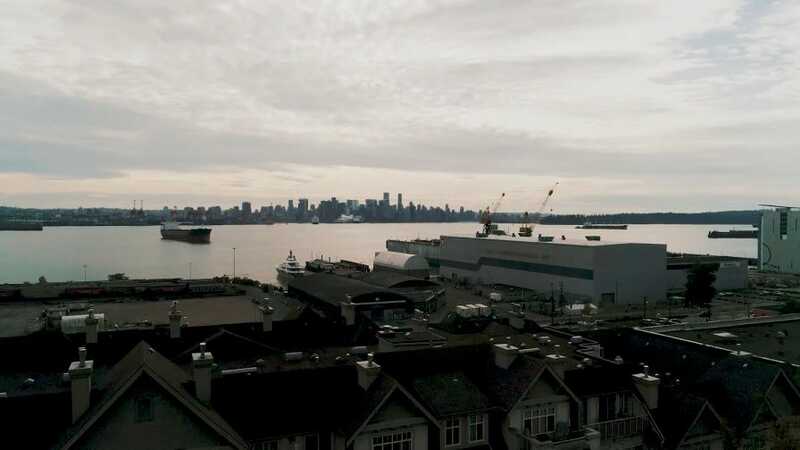 “If you maintain a sharp blade with a proper set, you’re going to cut straight.” In the past, they’ve often used their CNC equipment in North Vancouver to level material. “But with the cutting we’re doing now, the wood looks like it has come out of a planer,” says Savics. “It’s all about a sharp blade and the set—it’s quite the art,” he added, noting they have set up their own blade sharpening and setting equipment including a Wood-Mizer BMS250 blade sharpener. “We’re still learning every day on the best way to deal with our product, from log to lumber,” Savics says. “When we first started out, we would pick up anything the tree service people would offer us. But now we understand urban wood better.” For example, twists or a crotch in a tree can be a sure sign of trouble. “Half of it might turn out to be firewood or a slight crotch could result in rot through the whole center of a log. 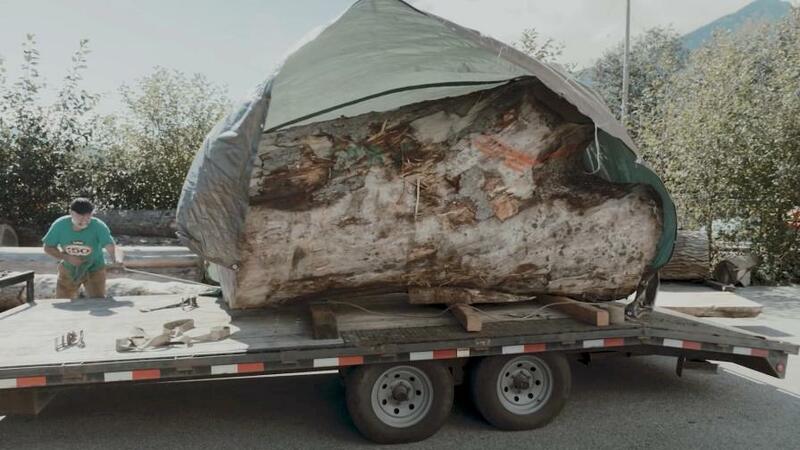 We now know more about what to avoid.” The whole area of drying such large slabs of wood has been an interesting challenge. 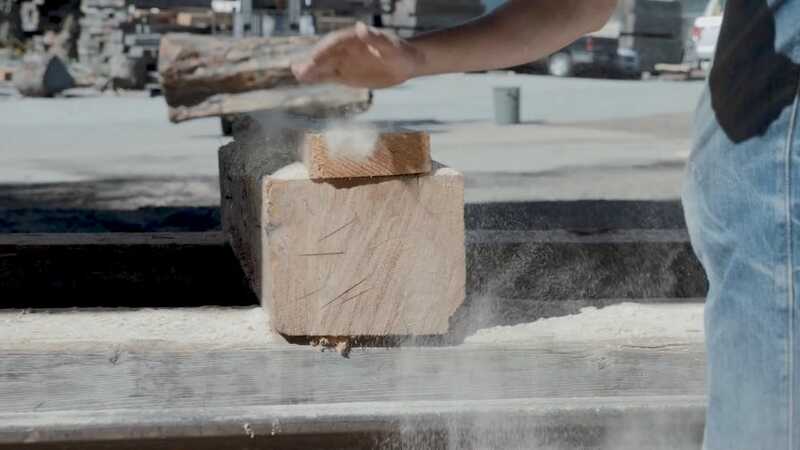 “We’re not talking about drying 2 x 4s or large timbers and beams—the science of drying that type of wood has been figured out pretty well,” says Hagge. Sometimes there might be some imperfections in the wood, but that is often welcomed by the woodworkers who are buying it, as they are producing artisan products, such as custom furniture. As far as they’re concerned, twists and cracks add character to the wood. 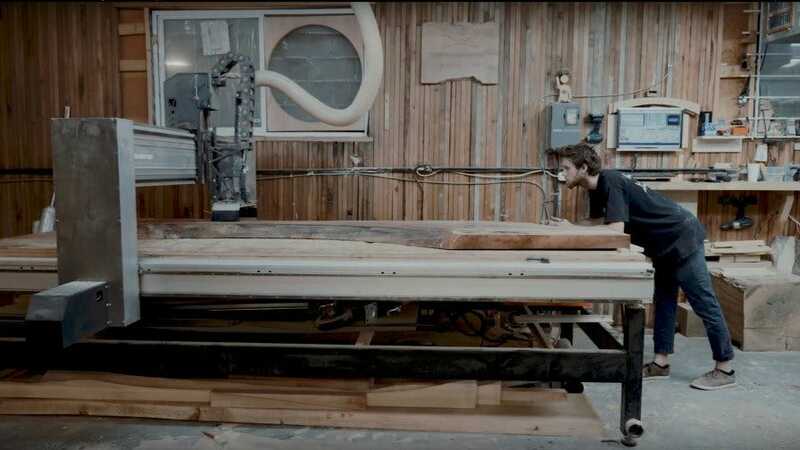 With the new sawmilling equipment in place and working well, Savics and Hagge are starting to think about the next step for the business, which would likely be setting up a larger woodworking shop and showroom in the Vancouver area, to complement the Squamish production facility. They’d also like to expand the online sales component of the business. “We always thought that people would want to physically see the material they are buying, but that is not necessarily so,” says Savics. “That could definitely open up a new revenue avenue for us.” Their six years in business have not been without challenges, but their slow and steady approach has paid off. “We have had hiccups,” says Savics. “But I think the reason the setbacks haven’t buried us is that we are quite deliberate and analytical in the moves we make. Everything we do has been backed by a ton of research, due diligence and a lot of conversations between us.” And there have been a lot of conversations with people in the industry, who Savics and Hagge both note have been very generous with their time. The support they have received, along with their efforts, will pay off, they believe. 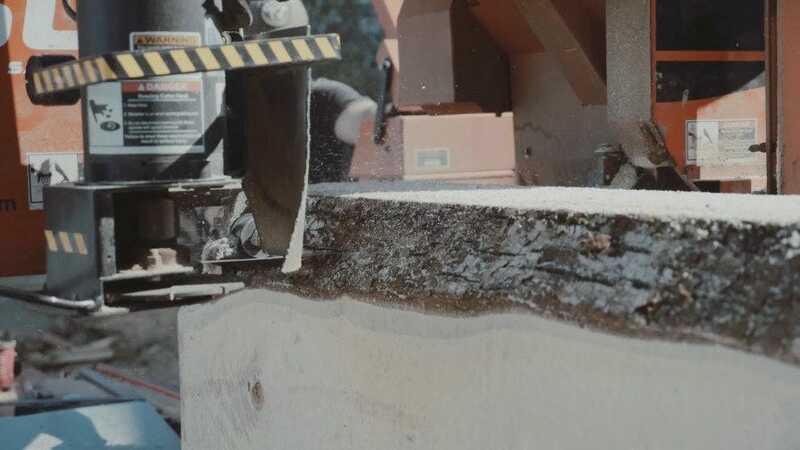 “All of our patience and hard work together is going to build this sawmill to be a pretty well-known custom sawmill in the Lower Mainland and British Columbia,” says Hagge.